I’m not sure how many of you, my blog followers, know about Sepia Saturday. …and the result is a fascinating collection of photographs, essays, poems, questions, revelations and various musings and mutterings from all over the globe! All who contribute make a point of viewing everybody’s postings, and the comments submitted are sent in good faith; they’re encouraging, funny, interesting and, sometimes, amazingly tender. This week’s Sepia Saturday prompt is an old photograph from the National Library of Ireland: a wagonload of people in what looks to be a late 19th-century version of a bus…four horses, drivers, passengers in hats, posed on a dirt road in a town someplace. Blankets? I thought; what can I possibly do with blankets? Didn’t take long to figure it out. My cousin Robert (almost everybody calls him Bob, but I think he’s more of a Robert), who lives about 25 miles away from me, shares with me a deep love of genealogy social history—he and I share old family letters, photographs, momentos; we give each other pieces of our shared history (his mother and my father were siblings). Robert and I are constantly handing each other gifts and treasures, and he surprised me with this blanket--one that's been hidden away in the family summer home in East Boothbay, Maine for close to seventy-five years. This threadbare wool blanket belonged to my father (see the sewn-in name tag! ); it was the one (I’m guessing) he took to college in the fall of 1936, his freshman year at Brown University in Providence, Rhode Island. The connection here is simple: my father would have loved Sepia Saturday. And so, his blanket, and my hope that you will find your way to www.sepiasaturday.blogspot.com; I hope to see you all there soon! Funny how words shift and evolve, isn’t it? In the 1700s, a canteen was simply a supply store; it’s from the French (cantine, a sutler’s establishment) and Italian (cantina, a wine cellar or shop). But the meaning shifted in translation, and “canteen” soon became to mean the item we know so well…a small tin container for water or liquor. Transporting water was always an issue—ancient nomads used animal bladders, closed tight with sinew and tied to camels for long crossings in the desert; shepherds hollowed out gourds, stuck a plug in the necks and hiked up to high pastures where they summered their flocks; cowboys made bags of leather and strapped them to saddles on cattle drives across the American west. Some canteens were even made of thick colored glass—they were designed to transport liquors from distiller to market. I’ve found some in old house dumps behind old New England farmhouses, seen others in antique stores, and they are quite lovely on display. My maternal grandfather spent some time in Italy before WWI; he was a pediatrician, and made many trips to Europe studying diseases of children. On one of his jaunts, he ended up in Florence (Firenze), where he purchased this lovely Pilgrim’s Flask for my grandmother. It originally had a leather cord attached to each of the lion heads on the shoulders of the bottle, but that’s been gone a very long time. My grandmother never drank anything but sherry (the sweeter the better—sweet enough to choke a bat, I hear! ); I doubt she ever stashed any of the hard stuff in it, but I do remember the occasional floral arrangement on the kitchen table – bright flowers above the neck, stems pushed down inside. Eventually, a canteen took the shape we know today – a roundish tin water bottle carried by people on the move – soldiers, travelers, those on the road; Girl and Boy Scouts used them (you bet we weren’t carrying booze, though!). They all had straps or clips or belts, they were sometimes covered with leather, flannel, or even wool. Well, I’m not so sure about the gypsies and the thieves, but definitely tramps – a whole collection of ‘em. This photo was taken in the back yard of my parents’ house up in the West End of Portland, Maine. 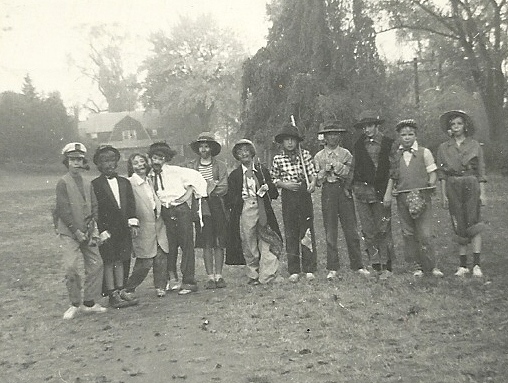 I think it’s the fall of 1956; if so, I am ten years old (I’m the fourth from the left, white shirt, string tie and mustache). The Gang – a motley collection of best friends. We all went to elementary school together at the McClellan School – we walked along brick sidewalks to school every day, came home for lunch, walked back in the afternoon. We played together after school: rode our bikes together in a loose pack down to Dudley-Weed Drugstore for popsicles on hot days, went trick-or-treating on Halloween, climbed the monkey bars and gave the swings a workout, roller skated, hop-scotched and jump-roped in the schoolyard, shimmied up street poles and twisted the street signs around (our worst offense, I’m sure). Some of our fathers were doctors; some were civil engineers, bankers, teachers, lawyers…our mothers were, mostly, “stay-at-home moms,” although we didn’t call it that back then – it was simply a given, a natural state of affairs in the decade after WWII. Our parents were all friends. They partied together: I remember a progressive party they had: one house for cocktails followed by a walk through the neighborhood in their formal dinner clothes to another for appetizers and more cocktails, a third stroll to a third house for dinner, down the street to the fourth for dessert, a final trek to the last house for coffee! They took us caroling through Portland’s West End at Christmas time (with an upright piano in the back of a pickup truck and the rest of us walking in the street, singing; a light snowfall made the whole event even more magical) and they went sledding with us on the Western Prom. We were all friends – both parents and children. All the parents are gone now (save one, who is 100 this year); all of these tramps are still alive as far as I know, although we seldom see each other. Yesterday, I had lunch at a low-key restaurant in a nearby town with two of the other Tramps in this photo who are up here for the summer months – the second from the left (M., in tuxedo and high-top sneakers) and the fourth from the right (P., underneath a broad-brimmed hat). We ate and talked, caught up on each other’s lives, congratulated ourselves for being in pretty good shape as we push into our 70s (I was the only one with an Artificial Body Part!). …still tramping together after sixty years! Behold the Enterprise Stereopticon with a Seroco Acetylene Light, advertised in the 1902 Sears, Roebuck & Co. catalogue—the “highest grade” of lantern made. The full set came with a Seroco generator and a Simplex burner for firing the acetylene, a high power single stereopticon with carrying case, a 120 square-foot white screen, 52 transparent views in a polished wood case, and an accompanying lecture, bound in book form for easy reading by the operator to the audience. There were several topics available: some of the most popular lectures were patriotic and military: The Maine and the Cuban War, the Boer-English War; religious and travel: the Passion Play Series, Life of Christ on Earth and—one of my favorites—Around the World in Eighty Minutes, a precursor, perhaps, to the more familiar (to us) eighty-day hot air balloon excursion. There were eighty views in this series, so the audience saw one scene per minute. Only fifteen slides in this set, but all with color added! Fifty-five slides in this set, twelve of which had added color. The entire set cost $53 (a bit over a thousand dollars today—a substantial investment), but a traveling lecturer with an established circuit could earn that in a week by renting a hall in each small town, charging admission for two or three presentations, then moving on.